...if only every morning could start like this! Even my husband who "doesn't like Nutella" ate two of them and said these belonged on the menu at a "fancy pastry place." Sorry, honey...I hate to be the one to break it to you, but you officially like Nutella now. 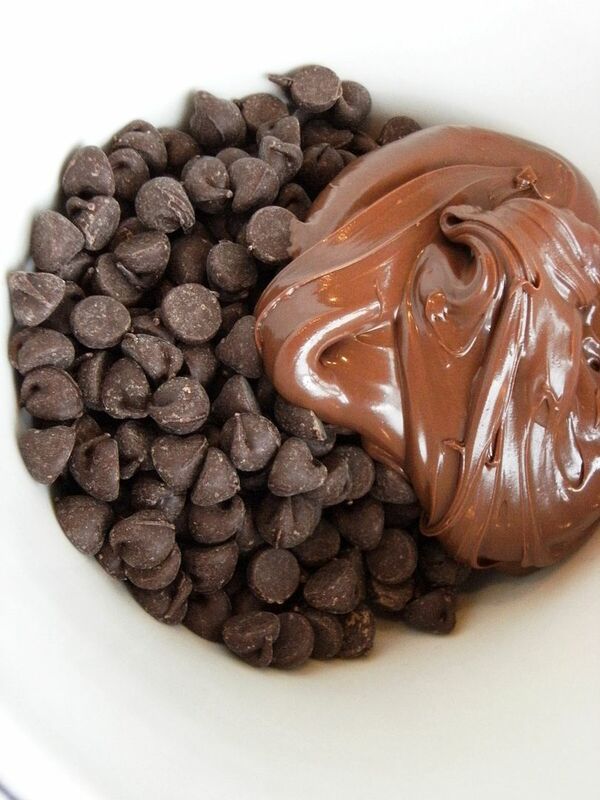 Stir together 1 cup chocolate chips and the Nutella. On a floured surface, roll out the puff pastry into a 12 x 12 inch square. Use a pizza cutter to cut into 9 squares. With a fork, whisk together the egg and water. Using your finger, apply the egg wash to 2 adjacent sides of each square. Add 1 heaping tablespoon of the chocolate/Nutella mixture to the middle of each square. Fold over to make triangles and press to seal edges. 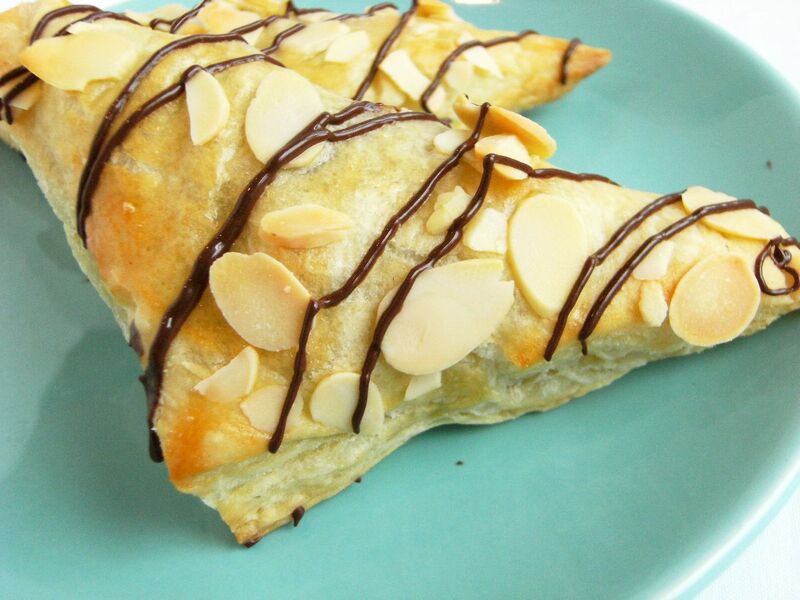 Brush the top of each turnover with egg wash. Sprinkle with the slivered almonds. Bake for 15 minutes. Meanwhile, melt the reserved 1/2 c. chocolate chips and the shortening in the microwave on 50% power in 30-second intervals. Stir after each interval until melted. Set aside. Remove the turnover for the oven and place on a cooling rack for 10 minutes. Spoon the melted chocolate into a quart-sized freezer baggie (a storage baggie might burst) and snip a hole in one corner. Squeeze over the turnovers in a decorative pattern. Having guests for Christmas? They are going to love these! The real question is this. Did you tell him it had nutella in it before you served it? I love tricking people into loving something they say they don't...haha I'm horrible. Now I know what I can do with that puff pastry that is sitting in my freezer...yum! Nutmeg...NO, I did not! ;) This will be the first he's hearing about it!!! I'm on the lookout for a comment from "Mr. E."
Oh, these look sooooooo good! I love Nutella! I have fond memories of sitting in the kitchen of an English hostel as a 20-year-old, eating Nutella for the first time. I scooped it out and ate it straight off the spoon. *sigh* if only I still had the metabolism I did back then. I love everything with nutella!! I made nutella mousse the other day and man was it delish! 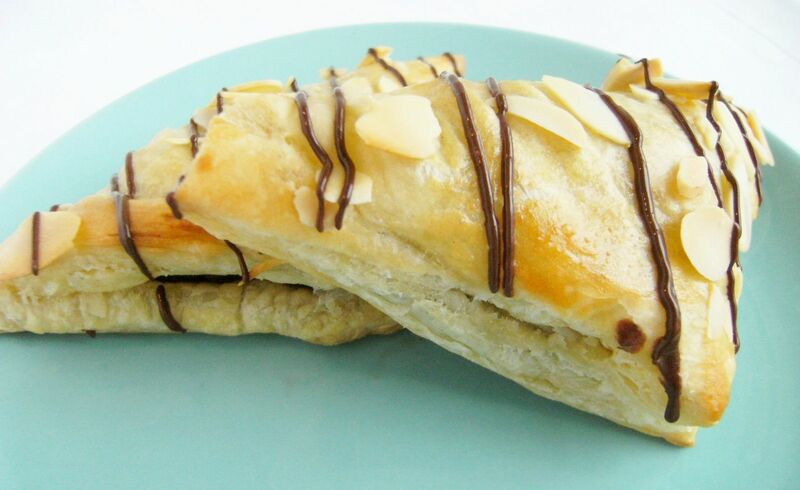 ..never tried turnovers with nutella they sound amazing! this is my nutella mousse ! Well at least you managed to prove that he does! I wish my breakfast would look like that everyday......yum. Wow, these look super yummy! I'm hosting my son's playgroup at my house this Friday, and I am so going to make these!!!! Those sound and look amazing. I hadn't heard of Nutella until I started blogging about 8 months. Those turnovers look and sound great! I have never tried Nutella- never appealed to me, but I think I'm going to have to give this one a try!! they sound delicious!! I agree with your hubby! Oh these are so going on my list for Christmas morning! I was looking for something new and sweet to add to the usual mix of eggs and such. I'll bet if I made these for my hubby, he could knock out the addition to the house he's planning to start on right after Christmas (pray for me!). Nutella is so yummy...but I'm with Janet...it's dangerous...my metabolism has slowed down too. Oh goodness do these look good!! You are seriously evil for showing these to us. Just kidding, of course. They look absolutely divine. Now if I only had time to make them. Swooning. yummy!! there is no dieting in December, isn't that a rule?! OHHH MYYY GOSSSHHH. Yes please. I'll bring the coffee, what time is breakfast? wow, I have to try this very soon. Thanks for the treasure find. These look AMAZING!!! You have got it all girl!! Beauty, brains, and MAD baking skills! I must try some of the Nutella! Seems to be the latest craze! Finally posted my traditional Christmas Cookies if you want to pop over! Still sad I wasn't able to link this OH SO TRADITIONAL family recipe up to your Traditions theme! There is only one word for this: YUM! Those just look amazing. Wow! These look awesome. I'm not too big of a nutella fan either ;) But my brother sure is. Think I might make these next time I stay over the parents house for him! I'm eating nutella as I write this comment!!! YIKES and I just finished it. Going to have to go buy another jar to make these. They look delicious! I can never say this enough...you are a genius!! You always post the most creative recipes! Not like Nutella? Your husband was certainly in the minority, I believe. Glad he has seen the light! 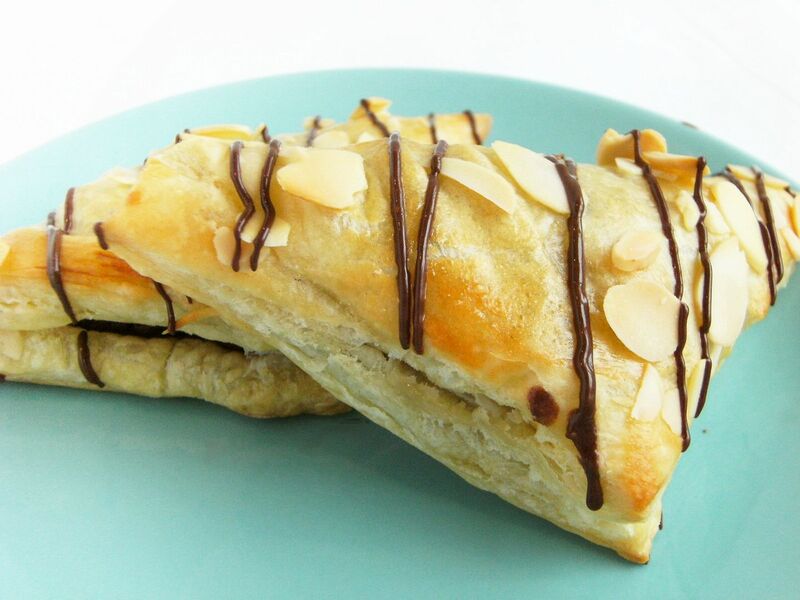 The turnovers look great! 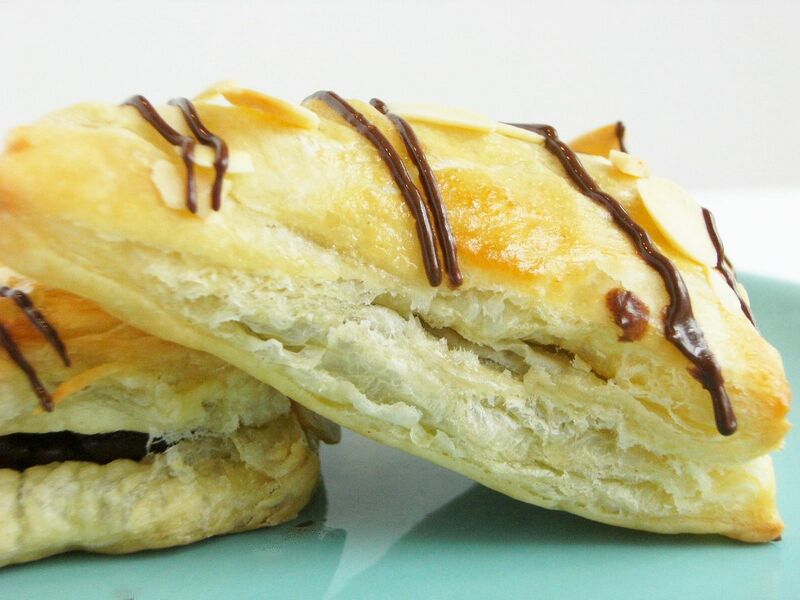 Isn't it wonderful how simple puff pastry can make a girl feel like she's the premier chef in a chic Paris bistro? You'd be my hero if you gave me one of those for breakfast too! Yum!! First of all...I LOVE Nutella! Secondly...my husband just told me he needs something to take to his school (he is a teacher) for a breakfast they are having on Friday. I think I just got my idea! THANKS! These look AMAZING! Oh my! These look sinful *she says while licking on a spoonful of Nutella! holy cow, these look SO freaking good!! Those look fabulous! Thanks for sharing! LOVE your blog! Could you possibly do a blonde brownie with coconut, pineapple and white chocolate? I had one at sugar daddys in ohio and i tried to make it at home but just can't get it right. Is Nutella not the best food on earth??? Ok, just read the comment about QVC. Thought I was losing it!! Good to know your not on QVC. They approached us, but we're not into that much mass production, plus they don't want to pay enough for such a handmade product. Can you tell I'm not a fan of QVC? Put soem chopped bacon inside and these would be even more fantastic. I've still never tried Nutella BUT I really want to soon! All of your food always looks divine! Also, I just made royal icing and didn't do anything special because I ran out of time. :( So, I didn't do that sanding sugar technique that you showed on those pumpkins. BUT it's still top of my list to try!! :) When I do, I will be sure to link to you. Thank you so much for all your inspiration! We made these New Year's Day and they were so yummy. We now have a new tradition! :-) Thanks for the recipe. Oh My...can't wait to try these! Sounds delicious!!! Thanks for sharing the recipe. Happy World Nutella Day.